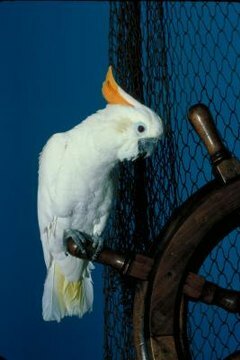 One of the single most important factors in your cockatoo’s health, mood and behavior is the setup of his cage. An agitated, restless bird is often the result of an improper cage arrangement. Your cockatoo, like other parrots, has very specific environmental needs that may actually run counter to what you might assume he wants. The key component of a correct cockatoo layout is ensuring the bird can inhabit it without stress or danger. Place the cage in a location from which the bird can observe his world in safety. Cages should not be put by an open window or in the center of a room. Invest in a high-quality square cage with thick bars. Cockatoos are powerful enough to escape cages with thin bars and can be injured in the process. The cage should be big enough for the bird to move around freely, even with his toys and feeding equipment. Additionally, your cockatoo should not be able to fit his head between the bars of his cage. Provide your bird with at least three different perches. A cockatoo requires a high rope perch for sleeping, hung in a U shape, and a couple of other perches for the sake of variety and comfort. Keep at least three “puzzle” toys in your cockatoo’s cage that require him to work for food or treats. This helps to keep his mind engaged. Stock the cage with a variety of other toys for shredding. Your Cockatoo’s cage is his home, and he should feel comfortably camouflaged by the placement of these additional toys. Place food and water dishes in the cage, but don’t feel the need to hang perches right next to them. Birds have to work for food and water in the wild, and should have a similar experience in the cage.